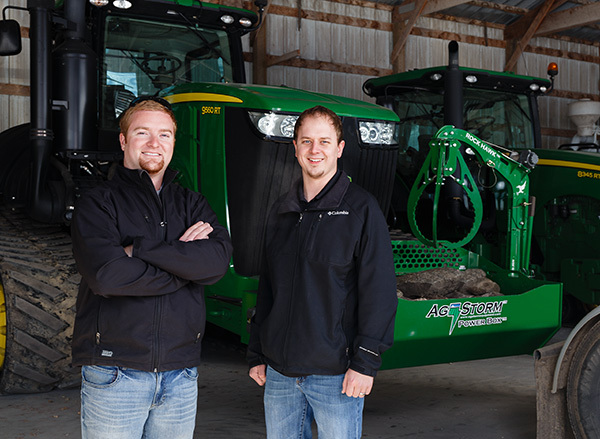 When the concept for a new piece of ag equipment struck, cousins Tyler and Ben Wenner made the idea real as a stepping stone to further innovation. Farmers face many obstacles each spring when they are ready to plow their fields: they are at the mercy of Mother Nature, they need to make sure their equipment is ready to go, and they have to pick rocks. It used to be that every spring farmers would spend days picking rocks. And these are not rocks you’d find on the shoulder of a road. Sometimes these are big rocks, boulders really. Bohemeth. Picking rocks from fields can be one of the more laborious jobs for a farmer. But, on the farm, it is most certainly necessary. Growing up on farms near Nicollet, Ben and Tyler Wenner would experience this annual tradition. And they just knew there had to be a better way to do this labor-intensive, at times mundane, not to mention costly, task. Time and money spent collecting rocks seemed unproductive to the teens. So, they began tinkering around with different ideas on how to make it better. And their minds wandered beyond just rock picking. “We were examining every aspect of agriculture in search of potential improvements, both with equipment and processes. We always ask, “Is there a better way?” And if there is, we will find a way to get it to the farmers that deserve it,” says Ben Wenner. They believed they were on to something, so after high school Tyler at age 19 and his 21-year-old cousin Ben, came up with a rock solid business plan. “We” refers to Ag Storm, the LLC the Wenners officially formed in October of 2012. Headquartered in rural St. Peter, Ag Storm manufactures agricultural equipment that is focused on innovation for an industry that is on the move. Ag Storm specializes in niche products that solve common problems in a fast-moving agriculture industry. Their first patent came in 2012; the Rock Hawk. The Rock Hawk is a rock picker that is mounted to the front of a tractor to pick up rocks. It works like a small crane, so farmers can pick rocks up on the spot while they are in the field. The Rock Hawk can pick up rocks ranging in size from a basketball to a boulder. “We have testing that shows the device can pick up rocks weighing up to 1,500 pounds,” says Tyler. As farms get more spread out, and the number of farmers is spread thin, Tyler says their equipment makes sense for a farmer’s bottom line. “It is worth the investment to a farm because rocks can cause tens of thousands of dollars in damage each season, if not more. It’s also expensive to haul around a skidloader or drive a loader tractor or back hoe around to pick up rocks that can’t be picked up by hand. So our products provide a real good return on investment to most operations,” he says. But the Rock Hawk was just the beginning. Ag Storm has since added the tractor-mounted Rock Box and the self-dumping Power Box. The Power Box™ is the first remote-controlled dumping rock box that comes in 3-, 4- or 5-foot widths. Ag Storm even sells weight kits for proper ballasting. Ag Storm’s intellectual property portfolio is ever-growing. The Wenners outsource all of the product manufacturing, so they can focus on research and development. “Most of our products create a new category altogether because they are a new invention. We haven’t scratched the surface of Ag Storm’s capability yet,” says Ben. Ag Storm will continue to invest in tooling and facilities so they can develop more products. And with several products now under their belts, the Wenners plan to invest more into their marketing efforts that will be directed toward dealers and customers. Ag Storm’s target customer is the forward-thinking farmer. The Wenners describe it as the farmer who isn’t afraid to try new things and who has a sizable operation. The Wenners consider themselves natural risk takers and it’s clear they are passionate about the agriculture industry. Their passion is obvious both on the equipment and the production side. Now that Ag Storm has the rock handling market covered, Tyler says they have products in the works that involve the planting and harvesting process. He says the projects yet to come are even bigger than the previous ones. As their customer base expands, so will their number of employees. Right now they have a few employees on a part-time basis. “We focus heavily on working with professional companies to provide the services we need. But that’s changing rapidly as we are needing people 100% focused on what we are doing,” says Tyler. The two are optimistic about the future of farming and the future of Ag Storm. Ben grew up on the family hog and crop farm in Nicollet County, so started running equipment and fabricating metal from an early age. In high school he let his entrepreneurial tendencies take over by building a sod, landscaping, and skid loader service from the ground up. He says deciding to start Ag Storm with his cousin Tyler did present some challenges. In his spare time, Ben enjoys fishing, hunting, and the outdoors. Tyler has long had a passion for agriculture. At an early age he began working at a John Deere location and that passion followed him to college. Tyler has a degree in Computer Integrated Machining from South Central College in North Mankato. After college he followed his passion by managing day to day operations on a crop farm. His experience also extends into the equipment manufacturing industry with commercial turf equipment, as well as truck accessories. Over the years, Wenner has worked extensively in product design, drafting, engineering, product development, manufacturing optimization, patent drawing illustration, plastic injection mold building, machining fixture building, and MIG TIG and Arc welding. Tyler says his biggest challenge so far was going against the grain and not following the expectations of those around him. In his free time, Tyler enjoys classic car restoration, hunting, fishing, and entrepreneurship. This isn’t just another rock picking device. The Rock Hawk enables you to remove most rocks from the field onsite and in short time. It’s the most convenient attachment available for removing rocks because it’s always with you when you need it and never in the way. The Rock Hawk works like a small crane mounted on your tractor. It has a self-tightening 3-claw grapple assembly on the end of a cable and it uses 12V DC power from your tractor’s battery to run the winch. To pick up a rock, you release the assembly from the locked position. You then lower the claws, push them into place around the rock, and stand back to lift it. Once it can clear the rock box, you rotate the mast 180˚ and lower the rock into the box. Reel the claws up tight to the boom and lock the mast and you’re on your way. The Power Box comes in 4-ft, and 5-ft widths. The unit is easy to install. Simply bolt on the Power Box with its custom mount made to fit your specific tractor, hook up a positive and negative wire and you are ready to go! It’s as simple as that. The Power Box flips the entire box upside down ensuring that no rocks get stuck in the box. The high quality Rock Box from Ag Storm sets the industry standard for on-board tractor rock handling units. The precision manufactured Rock Box is durable, reliable and built to take the toughest loads. All Ag Storm Rock Boxes feature tapered sides and front, preventing rocks from getting stuck once the bottom is opened. The spring loaded pop pin snaps into place when the lever is pulled back to lock the box. No clips or latches are used. Ag Storm Rock Boxes with weight kits are cheaper than suitcase weights per pound! Save money on ballast weight and have a Rock Box on the front of your tractor. Ag Storm’s Track Wheel Cleaners are the most effective way to remove debris from a track tractor’s rim. They require no welding or drilling and mount with two set screws for a solid mount. Each kit includes 8 total wheel cleaners for the inside and out of all the rims on a track tractor. They prevent the paint from wearing off the inside of the rim where debris becomes trapped and cause a rusty mess of an expensive piece of equipment. 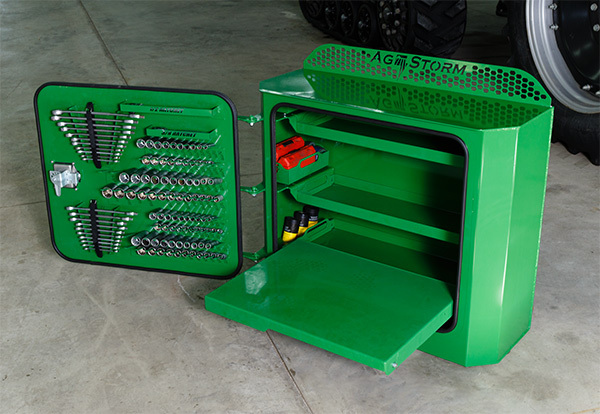 Ag Storm makes a universal toolbox (above) that is 100% water and dust proof, can be attached to virtually any piece of farm machinery, service truck, or pickup. You name it, the sky is the limit. Every toolbox has a laser-cut spot for every tool, a fold-down work surface, adjustable shelves, and just about anything else you could ask for in a toolbox that’s with you when you need it.